Offer Terms: New players, min dep £10. £30 bingo tix +20 Spins on Stampede, wins capped at £5, WR: 85x (bonus); 4 tix to "£2,500 Real Cash" (real cash wins). 10 tix to "£50 Daily Treat": WR: (4x bingo bonus). Games Bonus wins cap: £400 + the initial bonus amount. Deposit balance can be withdrawn at any time. Wagering restrictions & T&Cs apply. Polo Bingo was launched at the end of May 2010, with the aim to create a fantastic site that was sprinkled with a touch of glitz and glamour. The platform runs on the ever popular Dragonfish software, and the site really does ooze sass and sophistication. The theming matches that of a glamorous parisienne nightclub, with pink and gold hues and hints of diamonds and sparkle throughout. The layout itself is really clean and classy, and you’ll find all the fantastic games and promotions shining brightly across the top of the homepage with additional links to the community hub and winners stories too. The gaming on offer really lives up to the brands classy feel, and you’ll find a dazzling array of high quality bingo and side games available 24/7. The main bingo games come in either 75 or 90-ball formats, however you will also find special progressive jackpot bingo games, aswell as the odd game of 5 line Swedish bingo from time to time too. There are hundreds of deluxe slots and casino games available at Polo bingo too, some reaching prizes of nearly £3 million quid, and you can also experience unforgettable wins on the Polo bingo chat room games as well. Mingle away with fellow showbiz Polo bingo roomies, and enjoy some time in the spotlight whilst boosting your winnings even more. 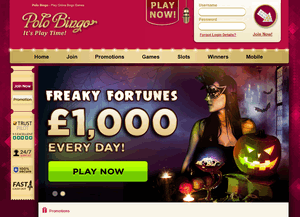 Polo bingo holds a huge loyalty towards its players, and are constantly offering exciting promotions and big rewards. There is currently an amazing welcome bonus, aswell as a great variety of other monthly and seasonal promotions on offer too, plus a bonus loyalty scheme and the VIP Diamond members club. There are always great promotions on offer at Polo Bingo, including a fantastic welcome bonus, details of which can be found via the link at the top of this page. This is such a great way to take a trip down the red carpet and really get a feel for what Polo Bingo has in store. Terms and conditions apply, and all players must be aged 18 or over. Other promotions can change weekly, monthly and seasonally, and all offer ways to increase your winnings and really feel like a star. You could win up to £250 nightly on the 75-ball Money Penny bingo jackpot. Tickets cost just a penny a card, and players can purchase up to 96 cards a game. Prize funds range from £25 up to £250 per game, and jackpots depend upon how quickly a winning ticket is called. With games taking place every night at 11pm, you really want to grab a front row seat for this one. Are you ready to be a millionaire? Then get your tickets for the Self Made Millionaire Jackpot. This takes place every 3rd Saturday of each month at 10pm, and prizes can be bagged of up to £1000,000. Polo Bingo also offer a coin loyalty scheme and a VIP members club too. You can win loyalty coins throughout your play at Polo Bingo, and these can add up for extra treats and games bonuses. The VIP Diamond Club is available to invited Polo Bingo members, and allows players to climb the 4 levels of the pyramid to win exclusive prizes and rewards along the way. Polo Bingo is operated by Cassava Enterprises Ltd in Gibraltar, and the site is powered by the Dragonfish gaming software. The company are licensed and regulated by the Gibraltar Gambling Commissioner, and the UK Gambling Commission. The stage is set for some pretty showstopping bingo at Polo Bingo. You’ll find the majority of games come in either 75 or 90-ball formats, but there’s plenty of variety spread across lots of fun themed rooms. You can also play 5 line Swedish bingo too and there are tons of bingo chat room games always on the go offering little bonus treats throughout. There’s also a quick fire bingo variant on offer here called Racing Sweets. It’s a hybrid bingo game based on a 52-5 card game format. Games are played every hour, and it’s a fun fast paced game with sweet prizes up for grabs. Should you find yourself tiring of playing bingo at any point, the platform also offers up a nice selection of side games to keep you entertained as well. You’ll find hundreds of popular slots titles to choose from including Rainbow Riches, Fluffy Too, Irish Eyes and Unicorn Bliss, and there’s also a fantastic selection of casino and table games available too. There’s the option to play Roulette, Blackjack, Baccarat and Deuces Wild, aswell as special Deal or No Deal Video Poker and European Roulette. Please read all terms and wagering requirements upon registration, as details are always subject to change. Bingo wager is 3x deposit + bonus. There is also an extensive FAQ section found on the site. 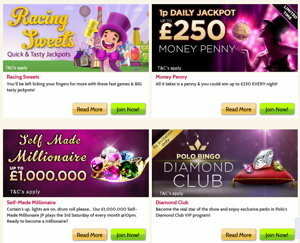 Polo BIngo offers a glamorous gaming platform that feels luxurious and lavish. The site itself is sophisticated and proffessional, and the gaming on offer is really varied and fun. You’ll find lots of different styles of bingo from classic to modern games, and the slots and side games are top class. If you’re after a sight with a bit of sass, then head on over to Polo bingo where the tag line simply states, “It’s Play Time”.